Whenever my wife and I have been in the market for a new home I’ve had a few personal deal breakers when visiting a property. One is that I’d never buy a house at the bottom of a ravine for fear of flooding issues during spring thaw or in heavy rains. Another is that we rejected a promising home because it had about 50 stairs to get up the steeply sloping lot to the front door. Aside from the inconvenience for us, I reasoned that young families and elderly buyers would also shy away. The third is that I wouldn’t buy a house on a corner lot. Here’s why. In addition to additional snow shovelling, corner lots also have larger side lots so there’s more grass to mow. But, given that corner lot houses are typically set back from the sidewalk, the yard tends to be on the side of the house, meaning there’s little privacy until you install a large, solid fence or view obstructing shrubbery. If you don’t install either, you can count on kids – and at least a few uncouth adults – cutting across the corner of the lawn as a shortcut, and passersby peering into your windows. You also might not be buying as much as you think. 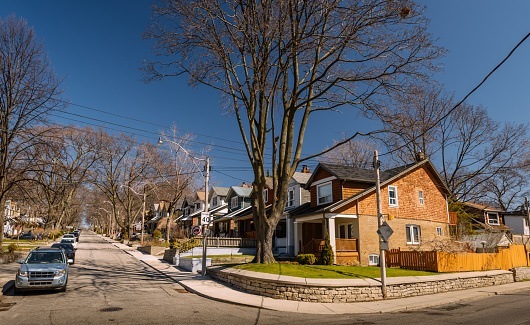 One man recently discovered that a side yard adjacent to the Toronto townhouse that he’d been paying property tax on was actually owned by the city, meaning there was nothing he could do to stop Bell from installing a large piece of equipment in the space he’d planned to use himself. Keep in mind that one or both of the street frontages will have a stop sign at the corner, meaning you’ll hear more than your share of squeaky brakes when people pull up to stop. You’ll also have to deal with headlights shining in the windows as cars turn the corner. Depending which way the wind blows (and we mean that literally), the house or your privacy fence/shrubs can also become collection points for neighbourhood trash. The long and the short of it is that there are a lot of downsides to a corner lot, and the sale price will almost always reflect that. Of course, there are exceptions to every rule. If a home has particularly nice curb appeal, extra curbs help accentuate that appeal. In that case, if the owner is a green thumb, the grass is definitely greener on a corner lot.